WEST KAZAKHSTAN REGION. Business needs infrastructure! West-Kazakhstan region actively solves the problem of lack of infrastructure for business. In the current year, the region has launched a project for the construction of the trade, transport and logistics centre, and in the near future there will be an industrial zone.Altai Kulginov, Akim of West Kazakhstan region, told us about that. Altai Seydirovich, tell us about the social and economic development of the region. One is happy who finds peace in his own home, people say. If there will be peace in the country, everything else will be alright. Therefore, our main objective is to promote stability and harmony. Today and in a long term, activity of the Executive authority is determined through the prism of the priorities outlined in the National Plan - 100 Concrete Steps. Peace of mind and creative spirit are formed from simple components: permanent and adequately paid work, peaceful life, confidence in the future and the future of your children. The Head of the State has laid a solid foundation for such welfare. Our goal is to move on to the more ambitious, but feasible goal - Kazakhstan joining the 30 most developed countries in the world. This is the main vector of development for our region as well - along with the improvement of the social well-being in the region, to ensure that the momentum of economic development. As you know, WKR has a very favourable geographical position: we have common borders with five regions of the Russian Federation - Astrakhan, Volgograd, Saratov, Samara, Orenburg and two regions of Kazakhstan - Aktobe and Atyrau. The great advantage of the Cusirals is the fact that we are a part of the Western macro-region, specializing in the oil and gas industry, mechanical engineering, food industry, construction industry, grain farming and cattle breeding. The region is rich in oil and gas deposits, borate ore, shale oil, potassium-magnesium salt, lime rock, cement raw material, chalk, expanded-clay, construction and warp sand. Thus, we have substantial resource capacity allowing to develop various industries. In West Kazakhstan region there are 80 industrial productions operating, as well as more than 45.8 thous. business entities, 79% of which are private entrepreneurs, 8% - agricultural enterprises, 11% - small business legal entities, and 2% are mid-sized business enterprises. According to the preliminary data for 2015, the GRP of the region amounted to 1817.1 billion KZT, or 2.8 million per capita. And based on the results of the seven months of this year, enterprises of the region produced goods worth 832.7 billion KZT. The main contribution to this figure was made by the mining industry, which accounted for 87.9% of all industrial production in WKR. And this is not surprising: World’s largest Karachaganak oil gas condensate field is located in the region. After commissioning of the fourth liquid hydrocarbons stabilization processing line at KPC, around 93% of produced raw hydrocarbons is delivered to Western markets via CPC and Atyrau-Samara pipeline. Another major object of subsoil use is Chinaryov oil gas condensate field, which was opened in 1991. Thereby, our region has high potential in the oil and gas sector, which beneficially affects its social and economic development. In addition, our region is among the four regions of Kazakhstan specializing in oil refining. One of the major companies in this area is Condensate SC. Part of it is fuel producing mini-refinery, which is located on the territory of the Karachaganak field, has the capacity to process 600 thous. tons of raw material per year. In recent years, the company has implemented a number of projects, including establishing the production of emission K5 class gasoline. At the same time, great attention in the region is paid to the diversification of the manufacturing sector of the economy. There is potential for the development of the mechanical engineering, construction, and others. As for the other industries, I would like to note the positive dynamics in the construction sector, agriculture and transport. In January-July of this year, 134.9 thous. m2 of housing was introduced in WKR, that is 19.4% more than a year earlier. The volume of completed construction works increased by 7.9% to 45.5 billion KZT. In the agricultural sector indicators increased by 6.7% to 49.4 billion KZT. The transport enterprises transported 21.3 million tons of cargo and 251 million passengers, respectively, or 100.5% and 99.9% when compared to indicators of 7 months of the last year. A stable situation in the sector of employment. Today the share of registered unemployed stands at 0.8%. Since the beginning of the year 4678 workplaces were created, 5814 people were employed. While average nominal monthly salary per employee increased by 19.8% to 133,195 KZT. Now we are implementing a programme for the development of the West-Kazakhstan region territories during 2016-2020. Its primary areas and task at hand for us are the growth and diversification of the economy, creation of favourable conditions for improving the competitiveness of the manufacturing sector, attraction of investments and sustainable development of agriculture and SME, improvement of transportation infrastructure, providing consumers with high-quality public utility services, as well as improvement of the efficiency and modernization of the housing and public utilities systems, and others. According to the results of the current year, we must ensure the GRP and tax revenues growth by 2.6%. And we can already say that these indicators will be achieved. Amount of taxes and other obligatory payments collected for 7 months, totalled to 137.1 billion KZT (or 145.2% to the forecast), which is 27% more than for the same period of 2015. The growth rate of investment into fixed capital of non-commodity sector according to the results of 2016 will be 103%, including 106% in agricultural sector. Labour efficiency in the machine-building industry will increase by 46.5%, and by 32% in the metallurgy. The volume of retail turnover index is planned at the level of 103%. What are the indicators of WKR in terms of investment activity? Attracting foreign investment creates effective conditions for a real improvement of the production structure of economy, and regular work is being done in this field. If we speak in numbers, in January-July the volume of investment in fixed capital reached 194.8 billion KZT that by 26.8% more than the year before. While investment in industry increased by 35.7% to 166.2 billion KZT (including manufacturing by 84.7% - up to 8.2 billion KZT) and external investments by 58.9% to 133.5 billion KZT. The Map for the business support in regions includes 42 investment projects presented by our region totalling 329.6 billion KZT with the creation of around 2,300 permanent jobs. 33 of them costing 274.7 billion KZT were implemented in 2010-2015. As a result, 1,901 new workplaces appeared in WKR. Another 3 projects costing 46.6 billion KZT with creation of 171 workplaces were launched in the first half of this year. This is a plant for the production of emission K5 class motor fuels, meat processing factory and complex for the production of drinking bottled water. If we talk about attracting foreign investors, then among significant initiatives in this sphere I would like to mention the project for the construction of potash fertilizers plant of Satbor LLP, which is implemented jointly with the Chinese ICBC (CITIC Group, China). In addition, ABS-Munai LLP and West Hydrocarbons Commercial Investment LLC (UAE) plan to organize the advanced petroleum refining production in the Terekty district. In March Ural Transformer Plant LLP and private investors from Turkey signed a memorandum on the creation of a new JV - Ural Electric LLP, on production of electrical equipment. The visit of WKR delegation to Iran at the end of July of this year produced good results. Our entrepreneurs participated in the business forum, where they presented their potential in various sectors of the economy. Following the visit, 6 memorandums on cooperation were signed. And of course, we put high hopes on the International Forum and Exhibition "WESTKAZINVEST-2016", which will be held with the participation of foreign investors, and diplomatic missions from Britain, Finland, the Czech Republic, EEU countries, Germany, Iran, Spain, Italy, China, Turkey, as well as business structures of Astana and Almaty, West Kazakhstan, North Kazakhstan, Aktobe, Atyrau, Mangistau and other regions. What are the strengths and weaknesses of the investment attractiveness of the region? Examples that I cited above, indicate that we are among the most attractive regions for investors. As a strong side in the first place the stable social and economic, and political climate can be called . In the last 5 years alone, GRP of the region increased 1.8 times. While the share of industry in total volume of GRP exceeds 50%. Our indisputable plus is a unique geographical location. The region has the longest stretch of the Kazakh-Russian border totalling 1,532 km. The regional centre is situated at the crossroads of two continents - Europe and Asia, and its called the Western gateway of Kazakhstan for a reason. Of course, the Executive authority carries out certain work so that Uralsk conforms to such image. In particular, the approved development master plan, which is based on two objectives: the preservation of the historic part of one of the most ancient cities of Kazakhstan and the construction of a modern "smart" and an improved regional centre. In the next 3-4 years it is planned to reconstruct more than 100 km of roads, repair overpasses, pave sidewalks and improve common areas. Uralsk should become a safe city, for that purpose security cameras were installed, number of which continues to grow. Streetlamps are replaced with energy-efficient, pocket parks and parks are being equipped. This year the construction of a new public square is being completed, which will be opened in honour of the 25th Anniversary of Independence. Transformations involve medical care, housing and public utilities services, energy-efficient technologies are implemented using modern accounting systems. We pay particular attention to providing conditions for people with disabilities. Clean, beautiful and green, with leisure areas, fascinating history of Uralsk should become more attractive for tourists and comfortable for residents. One of the weaknesses of our region is primarily insufficient infrastructure. In particular, road issue remains a pressure point in Cusirals. Is something being done to resolve it? Positive changes are already there. Now under the Nurly Zhol program the construction of the road Uralsk-Kamenka-Russian border with a length of 104 km is being conducted. With its completion, we get a transport corridor connecting Kazakhstan with Saratov region, which is an economic giant, with further access to European countries. This year it is scheduled to repair 225 km of roads, both of regional and national importance. Eurasian Logistics LLP launched a project for the construction of the trade, transport and logistics centre Bask, which will be located in the area of chalk hills and the Sarytau microdistrict. There is a well-developed infrastructure and channels for transportation of the goods between Asia and Europe, automobile highway Western Europe - Western China passes through. Development of 12 hectares area, allocated for construction, is planned on a phased basis. The project involves the creation of 144 new jobs. On average, every month 11,500 panel trucks will pass through the territory of the Bask TTLC. The advantage of the object is the favourable geographical position, large market, and proximity of the five Russian cities (Samara, Saratov, Orenburg, Volgograd and Astrakhan). From an economic point of view, the project will help to address the systemic issue of insufficient parking for heavy vehicles and quality service. This will boost the logistic service of both existing and new transport enterprises, will contribute to the development of transport and logistics capacity of the country. Another line in the area of infrastructure business support is the establishment of industrial zones. In the past year, the Akimat of the region and the Turkish company Akgun Group signed a memorandum on the construction of the Kazakh-Turkish industrial zone (IZ) with the area of 300 hectares, near the Poyma station in the Terekty district. Choice of location was made due to its proximity to the regional centre (18 km) and the availability of infrastructure. Along the location the Uralsk-Orenburg and Samara-Shymkent motorways run, there is a railway station, mainline, approach roads, power plant and gas-distributing plant with high-pressure pipeline, Oral international airport, as well as underground water sources. Currently there is a search for investors willing to place their production on the territory of the IZ. Such Turkish companies as Osmanoglu PVC (production of building materials, construction equipment and PVC), Turkuaz Cable (power and high-voltage cables, communication lines), Orsan Textile (textiles and leather products) and Poyraz Group (household chemistry, mineral water, textiles and clothing) are ready to participate in its construction. In addition, there is an agreement between NC Kazakhstan Temir Zholy JSC and NC SEC Oral JSC on the establishment on the territory of the IZ of transport and logistics centre, as well as a memorandum between the Administration of Agriculture and the Iranian company Dashte Kakhnudzh about the construction of the greenhouse complex. What measures have been taken to improve business environment? The entrepreneurship is constantly in our area of special attention. The Akimat and DAMU Fund signed a memorandum under which 1 billion tenge was given for the financing of small and medium-sized business. Designated use of concessional loans, which are issued under 8.5% per annum, modernization of production and replenishment of working capital. The entrepreneurs working in the priority sectors of economy can use them. They can also count on the DAMU guarantee program in case of lack of collateral. Such a joint support of SME now is simply necessary. It will be a good support, will help to save existing and create new jobs. Fund allocated in July of 2016, 12 projects now are pending at the second-tier bank, worth 644 mln KZT, of which 7 are approved to be issued, amounting to 232 mln KZT. More than 50% of the funds will be directed to the business development in the districts of the region. It is planned to assimilate 100% of allocated funds by the end of 2016. Another priority is the reduction of administrative barriers. To this end, meetings were held with the business community, including visits to the regional centre and villages. Monthly meetings of the Council on the protection of the rights of business are conducted involving business structures and representatives of authorized Government bodies. The members of the Council discuss ways to address the specific situations involving infringement of the legitimate interests of the business. In order to develop inter-regional cooperation, negotiations with businessmen from other regions of Kazakhstan is carried out. For example, in April a meeting with businessmen was held in Uralsk, Karaganda region. Later the delegation of WKR visited the North-Caspian Regional Exhibition and Conference “Oil and Gas”, presenting the capabilities of our engineering companies. In June, WKR delegation visited Atyrau and Mangystau regions, during which memorandums with Akimats of these regions were signed. In addition, the cooperation agreement between Topan LLP and SEZ Aktau Seaport JSC was concluded, within the framework of implementation of the project on construction of a chemical plant on the territory of the Mangystau region SEZ. In early July, our delegations established a connection with entrepreneurs of North Kazakhstan region. As a result, memorandums on cooperation between a Consortium of Engineering Companies Mashzavod and KSP Steel LLP were signed. All these meetings are an excellent support for business that will bring its advantages. First and foremost it is the import substitution and increasing the competitiveness of domestic enterprises. Born in 1978. He graduated from the International Kazakh-Turkish University named after K.A. Yassawi, Academy of Public Administration under the President of Kazakhstan and the British University of Aberdeen under the Presidential International Educational Program “Bolashak’. Master of public and local administration, Master of international commercial law. From 2001 to 2008 worked in various positions in the Ministry of Justice, the Public Service Agency, General Prosecutor’s Office of the Rok. In 2008-2010 - Deputy Director General of Alash Media Group. 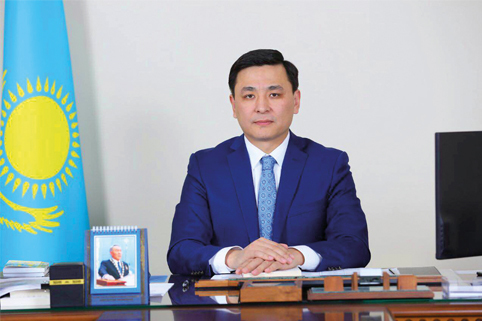 From 2010 to 2012 - Government Inspector of the Department of Government Control and Organizational and Territorial Work of the Administration of the President of Kazakhstan. In 2012-2013 - Deputy Akim of West Kazakhstan region. In 2013-2016 - Akim of Uralsk. Since March of 2016 - Akim of West Kazakhstan region.